You can find me online (Twitter & GitHub) on @phacks . React application code would be a Lego instruction manual, where bricks are DOM nodes . It takes care of how things look for the end user. On modern Web apps, how things look are usually a function of user interactions . In this analogy, the user is Elya, my 5 year-old niece. Red is her favorite color, so she wants the car to be red " . Developer Experience — Easier Debugging This is what the Redux Store of my current project look like. I can inspect every variable, which are updated in real time. allow us to have a finer-grained control about render performance. Developer Experience — “Reasonaboutability” React developer Jani Eväkallio coined the term “ reasonaboutability ” ( easiness to reason about ). I love it, and it matches perfectly what I feel about Redux. Here are the Three Principles of Redux: Single Source of Truth : all the data/UI state displayed on the app come from the same JS object. Facilitates debugging. Developer Experience — “Reasonaboutability” React developer Jani Eväkallio coined the term “ reasonaboutability ” ( easiness to reason about ). I love it, and it matches perfectly what I feel about Redux. Here are the Three Principles of Redux: Single Source of Truth : all the data/UI state displayed on the app come from the same JS object. Facilitates debugging. State is read-only : The only way to change the state is to emit an action, an object describing what happened. Provides a single, robust & semantic way to deal with interactions and to work as a team. Developer Experience — “Reasonaboutability” React developer Jani Eväkallio coined the term “ reasonaboutability ” ( easiness to reason about ). I love it, and it matches perfectly what I feel about Redux. Here are the Three Principles of Redux: Single Source of Truth : all the data/UI state displayed on the app come from the same JS object. Facilitates debugging. State is read-only : The only way to change the state is to emit an action, an object describing what happened. Provides a single, robust & semantic way to deal with interactions and to work as a team. Changes are made with pure functions : the Store can only be updated with pure functions (reducers). Prevents nasty side effects and facilitates testing. github.com/markerikson/react-redux-links is a great place to start! Code structure is key : Since all UI is derived from a single JS object, it needs to be carefully designed and constantly adjusted to business requirements. Tip: Learn from the best! Twitter & Pinterest both use Redux, and the structure is available for anybody to see with the React Dev Tools! Verbosity : to write a feature, you would usually need to write an action, a reducer, a selector , a saga … It can feel quite cumbersome compared to Angular 1. Conclusion React with Redux is a mature framework (React just turned five! * ) that empowers developers to produce performant apps with facilitated debugging and a standard yet expressive development flow. View Enhance your User (and Developer) Experience with React & Redux on Notist. After years of experiences building complex React & Redux web apps at Theodo, I’ve learned quite a bit of tools and techniques that make me more productive as a developer, and my users (and clients) happier with the products. – What is Redux for, and should you use it in your project ? When I first started using React & Redux, I would have loved to know this from the beginning — and I hope I can teach the audience what took me months to grasp! 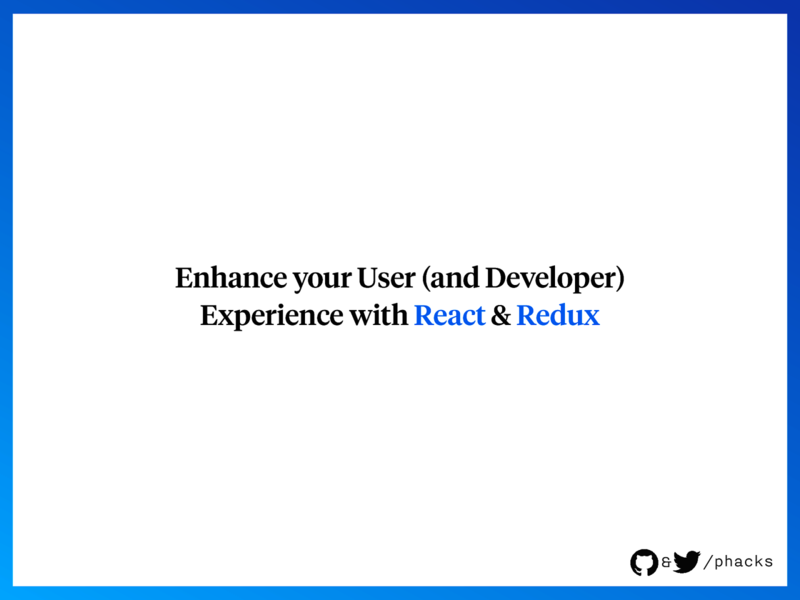 The talk would be best for attendees having a prior experience in React and Redux, although I’m planning to explain the basics at the very beginning. Nicolas puts presentations on for free. You can too.